With the demise of Target’s REDcard (aka REDbird), is it worth keeping open or should you switch over to one of its relatives? That’s a question you’ll need to answer for yourself, but in this post we’ll look at what each card brings to the table to help you decide which card to keep in your arsenal. Serve, Bluebird, and REDcard all run on the American Express network using the same prepaid platform. That’s good in the sense, that they are all virtually the same other than a few minor quirks, but it’s bad in the sense that you can only get one (see below). So, what differentiates them? Bluebird was American Express’ first attempt at partnering with a big retailer (Walmart) to create a prepaid product. It wasn’t Amex’s first prepaid product, but it was the first one really useful for manufacturing spend. In other words, Bluebird was the original manufactured spending machine. Serve is the only prepaid card of the three that doesn’t partner with a retailer. Because of that, Serve doesn’t offer any retailer benefits such as the 5% you save at Target with REDcard, but it is one of the most MS friendly cards of the three. That’s primarily thanks to the ability to load Serve online with a credit card which cannot be done with Bluebird or REDcard. REDcard is the newest of the three prepaid cards. For awhile, it was by far the easiest card to MS with, thanks to the ability to load directly with a credit card. Unfortunately, as you all know, that benefit has died which has leveled out the playing field significantly. Despite the loss of that amazing benefit, Target’s REDcard is still a great tool to manufacture spend with. In addition to that, it’s a great card for regular Target shoppers since it offers free shipping and 5% off all purchases. Why Can’t You Get All Three? Unfortunately, since all three of these cards run on the same Amex platform, they only allow each person to have one. Fortunately, though, it’s an easy process to switch between the three. The reason most, if not all, of you are reading this post is to determine which of American Express’ three prepaid products is best for manufactured spending. Regardless, for those who don’t know, these three cards are the ultimate manufactured spending machines. Well, they’re not really the ultimate MS machines, but they’re as close as you can get at this time. So, how are they MS machines? For one, they can all be loaded online with a debit card. If you happen to have a reward earning debit card such as PPBDMC, UFB Direct airlines checking debit card, or Suntrust Skymiles checking debit card. This won’t bring in thousands upon thousands of points each month, but it will add a little bit of MS to your points toolbox. Where these cards really shine is their in-store load-ability. Each one can be loaded in-store (REDbird at Target, Bluebird and Serve at Walmart, and Serve at Family Dollar) with prepaid debit/gift cards. Those debit/gift cards can be purchased at multiple different stores for a small fee that ultimately earns you points and miles. 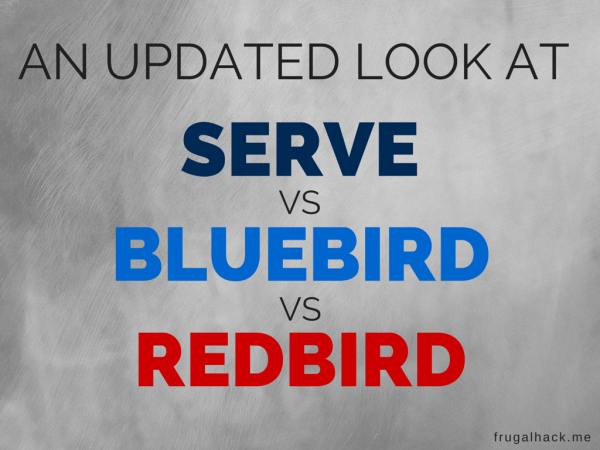 Realistically, Serve, Bluebird, and REDbird are just used for liquidation. They don’t really earn you new points, they just help you liquidate the cash equivalents you bought to earn points and miles in the first place. Online debit card loads must be bank issued. You cannot use prepaid or gift cards to load any card online. Online credit card loads must be American Express cards. Cards issued by American Express do not earn points, but cards issued by other banks running on the Amex network do. Vanilla cards used at Walmart (eg. OneVanilla prepaid debit cards) can only be loaded in $49.99 intervals. Gift cards used to load these prepaid cards in store must have a PIN. Amex gift cards will not work. Gift cards will not auto drain at any store. You will need to split the payment if you have multiple cards. The max you can load at one time in Target is $1,000. The max in Walmart is $1,000. The max in Family Dollar is $500. The per day max at Target, Walmart, and Family Dollar is $2,500. The trick with Family Dollar, however, is that they will only allow $500 to be loaded to all Serve cards they load at that store per day. So, if someone beats you to loading $500 that day, you’re out of luck. Bill pay is by far the easiest method of unloading these cards since you can bill pay your credit cards. It makes for an easy MS circle. If bill pay isn’t your thing, there are no lack of unloading methods (eg. ATMs, Bluebird checks, checking account transfers, ect.). Bluebird often runs Walmart promotions where you can earn cents of the dollar on regular Walmart promotions. REDcard on the other hand, offers 5% off all Target purchases and free shipping at Target.com. Serve doesn’t offer any benefits like Bluebird and REDcard, but Serve does offer the Amex offers (along with Bluebird) and credit card loading.